I’ll just make my own damn treasury! I wasn’t waiting for the treasury on Etsy to open up or anything, but earlier today, someone posted an announcement on Twitter that it was opening up soon. I decided to try and snag one, but I apparently missed it by just a minute or two. Well, fine. I’ll put together my own collection of favorites! I’m in a vintagey-steampunky-military-ish mood, and these items have all caught my eye in the last day or two (actually, I’ve been coveting a couple of them for a while now). They are full of wonderful details and embellishments, from antique lace appliques and faux fur hems to metallic thread stitching and exposed seams. With innovative construction and interesting lines, each of these handcrafted beauties would be a terrific addition to a seriously cool wardrobe. The last day to order for the holidays from my Etsy shop will be December 20th! You’ll still be able to order after that, of course, but I might not be able to get your purchase out to you before I leave for Kansas on the 23rd. Feel free to send me a message if you have any questions or concerns about your order! Well, This One Better Stick! Well, This One Better Stick!, originally uploaded by antigenre. 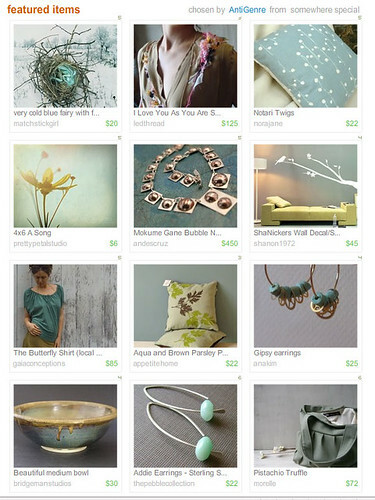 Click HERE to see it in Treasury West! I made a treasury this afternoon shortly after the server malfunctioned and a bunch of them disappeared. The ones that were made after that (like this one) either disappeared or got switched to another curator’s page. So I just did the same one in Treasury West! Hey, Copper!, originally uploaded by antigenre. I’m playing around with some new techniques and ideas and seeing what will come of them. I want to add more rings and bracelets to my store (getting a bit earring-heavy, ya know? 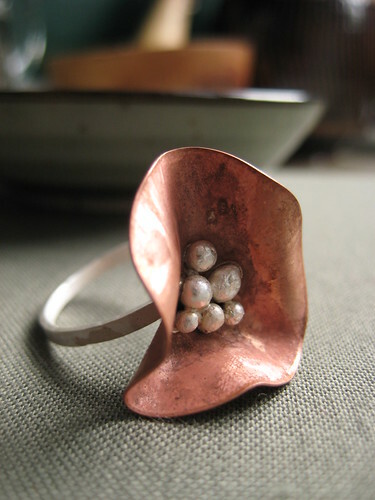 ), so I’m seeing what I can do with copper discs and silver grains. Something like this work-in-progress will be available soon in my shop. In other news, the treasury of the day (or two or three days, depending) is called ‘Firecracker COLLIDEoscope’. Take a here to see an explosion of colors!! …Pale, Cool…, originally uploaded by antigenre. Promoting my new treasury!! 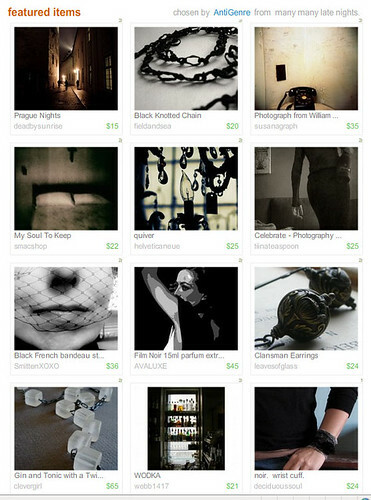 Take a look, and check out the shops of the wonderful artists featured here. Just click HERE or on the image above! Tools!, originally uploaded by antigenre. I’ve recently been on a bit of a buying spree for tools and reference material. 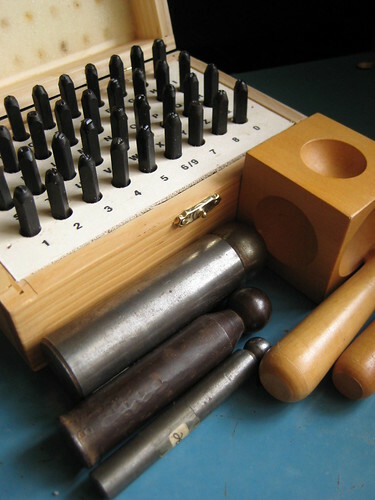 I just purchased this terrific set of metal stamps from Evie’s Tool Emporium, and came back from a trip to Metalliferous with a starter collection of dapping tools. Also, after ignoring the advice of people who really do know what they’re talking about for too long, I finally ordered a copy of Tim McCreight’s Complete Metalsmith. It arrived yesterday, and I’ve only given it a quick glance-through, but I’m already thrilled with how clear the step-by-step process are and how well it is answering some of my basic technical questions. Also, and totally unrelated, I snagged a Treasury West today quite by chance. The thumbnails below are just a few of the beautiful items included. Click HERE to take a look at the whole collection!! All the Cool Hues!, originally uploaded by antigenre. After three or four days of scorching hot weather, the heat finally broke last night – and it broke with a bang! Parts of New Jersey were slammed with heavy rain and high winds. At least it is a bit cooler, and my energy is starting to return. This means I might actually get some work done tonight! 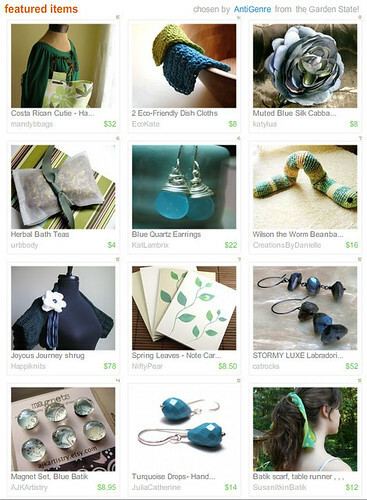 To celebrate the return to somewhat managable weather, I put together a treasury of fabulously cool items in beautiful and refreshing blues and greens from the members of EtsyNJ, the official New Jersey Street Team at Etsy. Click here to take a look at what the Garden State has to offer! This list will be around until the wee hours of Saturday morning. Night Treasury, originally uploaded by antigenre. I heard an old Marillion song the other day that I heard many, many times when I was living in Malta about 15 years ago. The song, That Time of the Night, will forever be associated with the first few weeks I spent there. It was February, and I was living alone in a huge apartment with excessively high ceilings, almost monastic furnishings and a barely functioning pay phone. It was rather chilly (the limestone building had no insulation) and very lonely. Things got better, though, once I made some friends and it got warm enough to go to the beaches. 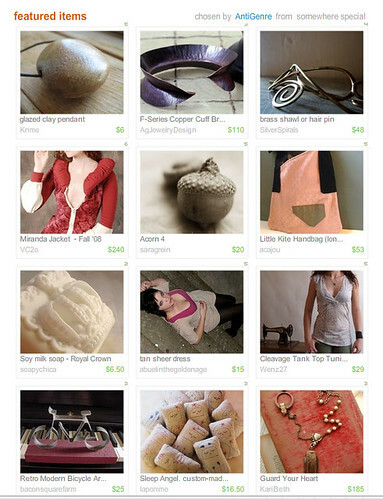 I made this treasury with that song and that time in mind. Click here to see it before it expires Saturday morning!